A cinematographer also is known as a director of photography (DP). 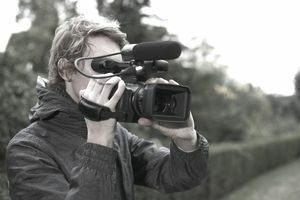 The person in this position is the head of the camera department and responsible for capturing the photographic impression of the directors' vision. While the director determines the action and blocking of a given scene, it is the DP who looks through the camera to catch the moment on film. The director gives his/her vision of a particular shot to the DP, who then translates that into how the camera will capture it. The DP receives a shot list from the director and then analyzes how each scene will be lit, which camera filters and lenses to use, and the position of the camera. He will put his crew into motion to make certain they get as close as possible to what the director initially had in mind. The DP is in charge of all camera operators, camera assistants, focus pullers, and lighting crews. Following production, the DP is responsible for making sure the film is processed to exact specifications. Your eye: Before the camera captures a shot, you need to fully envision it in your own mind. This is a skill that needs to be developed very early. Lighting: Study lighting. In everyday life, look around and see how light works to set a mood. You have to understand how to work with lighting to get the most out of your shots. Study the past: Study movies and find out what it is about certain shots that work and learn how it was accomplished. Technology: Stay up on the latest photographic technology. Technological skills are great assets to have, but you also must have a passion for the craft of cinematography. At its core, cinematography is an art form. It is a craft that must be mastered. After all, it often can make or break a movie or television program. There are numerous examples of great movies that could have been mediocre if the cinematographer had not been up to snuff. When you begin your career, don't expect to start at the top as a DP. You will be expected to earn your way up the ladder through your hard work, passion, persistence, people skills, and lastly, your talent. Gaining the necessary skills and experience to eventually earn a position as a DP requires doing some actual work behind a camera. Much like writers need to write to hone their craft, cinematographers must shoot scenes and small films to find out what works and what does not. Expect to start at the bottom and have no ego about it. You will gain the respect of those around you by doing so and they will be more eager to help you over the course of your career. This means your first jobs on a film crew might as a grip, for example, who provides assistance and support for camera operators. From there, you might advance to work as a focus puller, who helps make sure cameras are focused properly. Before advancing to the position of DP, you'll certainly need to work first as a camera operator. While working your way up the ladder, do everything you can to learn from others. After all, as the old saying in Hollywood goes, "the people you meet today are the people who hire you tomorrow." So, when you're on a set, learn from anyone willing to teach you. A great DP understands the workings of the entire set and is eager to learn new things. Could You Become a Line Producer for a Film Producer?